What is Virtual Aadhaar Card(VID) | How to get Aadhar 16 digit Virtual ID? Do you want to know about Virtual Aadhaar ID and to get Aadhar 16 digit Virtual ID? In this tutorial, you will know all about Virtual Aadhaar ID. It’s very simple and easy to download virtual Aadhaar card or VID. The step-by-step guide to Generate, Download and Retrieve your Virtual Aadhar ID. What is Virtual Aadhaar ID(VID)? How Virtual ID (VID) work? How is VID different from Regular Aadhaar/how is it more secure? 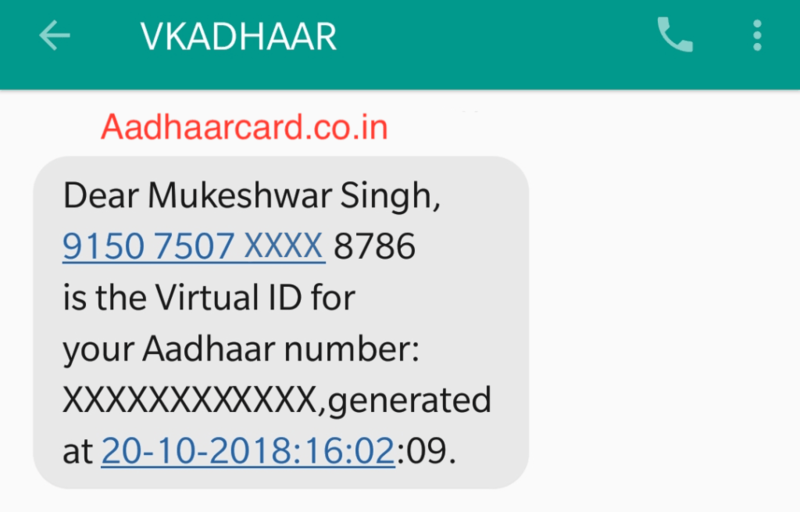 How UID token makes your Aadhaar Card secure? How to Download your Virtual Aadhaar ID? On 1st March 2018, UIDAI introduced Virtual ID as an alternative to the e-Aadhaar card and masked Aadhaar card, to ensure data privacy and to stop Aadhaar fraud. VID is a 16-digit number that can be generated using your Aadhaar number. This Virtual Aadhaar ID can then be used instead of Aadhaar Card. Just like one-time password OTP, this is a temporary number which will be valid until you generate new Virtual aadhar ID. It can be used for all services. You can use virtual ID or VID in place of Aadhaar card number for various purposes, including mobile SIM verification and Bank account opening also. Virtual Aadhar ID is connected to your aadhaar card; therefore if someone tries to access your data will not be able to do it. Then He/she will not be able to obtain your Aadhaar number or any other data. Then they will enter it into the system and then receive a UID token that confirms it, and provides a limited set of demographic details only. Such as your name, phone number, address and so on. From now these agencies will now be able to verify your identity without ever actually knowing your Aadhaar number. UIDAI virtual ID can also be used to perform many other aadhaar services like uidai Aadhar download, retrieve lost Aadhar, etc. The Aadhaar 16 digit Virtual ID (VID) add a layer of security over your aadhaar card, by making it more difficult to get access to your Aadhaar number. A vital aspect of the security is that the Virtual ID is temporary and revocable. Every time you can generate a different VID. It’s not possible to find the user data from VID as it is a Virtual number and only UIDAI knows the connection of that Virtual number with Aadhar Card. Virtual ID’s are not permanent and can change. The Uidai claims that it will not be possible to obtain the Aadhaar number from the Virtual ID. Virtual ID does not reveal your Aadhaar number or your biometrics data like Regular Aadhaar card. UID token is 72-characters alpha-numerical string which will be forwarded to the agency after you use Virtual Aadhaar card number and every time a new series will be delivered. 2. Click on the Virtual ID (VID) Generator option under Aadhaar Services, and you will be redirected to a new page. 3. Enter your 12 digits Aadhaar Number and fill the Security Code as displayed in the image. 4. Click on send OTP (One Time Password), then OTP will be sent to your mobile number registered with UIDAI. 5. Enter the OTP and Click on Generate VID(If not selected) option under OTP field, then click Submit. 6. If your VID is successfully generated, then you will see and Green Tick. 7. You will receive the message on your registered mobile number with the 16-digit Virtual Aadhar ID number and the last four digits of Aadhaar. 8. Now You can use this VID number as your Aadhaar Card Number. You have already Generated your VID Number, but what if that message containing your VID is deleted? What will Happen if you lost your VID Number? Don’t Worry as now you have the solution. If you have lost your VID number, then you can also generate a new one as it will also do the same function. 2. Click on Virtual ID (VID) Generator located under Aadhaar Services, and you will be redirected to another page. 3. Enter your Aadhar Card Number, Captcha and click on Send OTP. 4. Enter your OTP and click on Retrieve VID under the Enter OTP field. You will also receive a message “Congratulations! Your Virtual Aadhaar ID Successfully Retrieved and sent to your registered mobile. 7. You will receive your VID Number on your Registered Mobile number. This message will be the same as the message you received during the VID Generation. If you have a problem related to VID, then check out this FAQ’s section or you can raise a Complaint to UIDAI. VID or Virtual ID is a 16 Digits Number generated from your Aadhar Card. This service was made when UIDAI came to know that people are not happy with sharing their Aadhaar Number with Banks, Institutions, etc. You can use your VID number instead of your Aadhaar Number wherever you want. And the Best Part? No one will ever get access to your Original Aadhaar Number. Now, you can generate your VID number online, but it will take a little longer than what it takes with the app. So I will share with you, How you can easily Generate your VID from your mAadhaar App. Without further ado, let’s get started. 1. Open your App and Enter your Password to Fully Open it. 2. Click on your Profile and Enter the Password to open your Profile. 4. It will automatically send an OTP which will be auto-typed by the app once it receives the OTP. 5. Click on “Generate VID” and VOILA. 6. Your Virtual Id Number is Generated and Shown on your Screen; you will also get a message from UIDAI mentioning your VID as well. Do you want to Retrieve VID from mAadhaar? Then you are in the Right place. After Generating your VID, you may delete the message, or something happens with which your VID message is deleted. Well, in this case, you can either Generate a New VID Number or Retrieve the Old one. If you want to Retrieve the Old VID, then I will share How you can easily Retrieve your VID from mAadhaar. So without further ado, let’s get started. 1. Open your mAadhar App and Enter your Security Password to Open your App Properly. 2. Click on your Profile and Again Enter your Security Password. 3. Click on the three Vertical White Dots from the Top Right Corner of your Screen. 5. UIDAI will send an OTP to confirm that the real user is generating VID, the OTP will be auto written by the App after it receives the code. 6. Click on “Retrieve VID” and Done. 7. Your Old VID will be shown on the screen, and the message containing your VID will be received from UIDAI as well. Q. Can anyone else generate VID for me? A. No other entity like Aadhaar authentication or Aadhaar e KYC can generate VID on behalf of Aadhaar number holder. Q. What if an Aadhaar number holder forgets VID? Can he/she generate again? Q. Can VID be used for OTP or biometrics or demographics authentication? A. Yes. VID can be used instead of Aadhaar number in Authentication API input. Various entities will update their Aadhaar authentication application by 01.06.2018 to accept VID as an input for authentication. Q. In case of VID, do I need to provide consent for authentication? A. Yes, Aadhaar number holder consent is necessary for VID based authentication. Q. What is the expiry period of VID? A. At this time there is no expiry period defined for VID. VID will be valid till the time the Aadhaar number holder generates a new VID. Q. Can we do Aadhaar correction through VID? A. No, you cannot do aadhaar correction through Virtual Aadhaar number, but you can update Aadhaar information through SSUP update. Q. I do not have an Aadhaar card. Can I get a virtual ID? A. To generate virtual ID should have Aadhaar number. If you do not have an Aadhar card its ok, but you need to have Aadhaar number and linked mobile number. Q. I have my Enrolment ID. 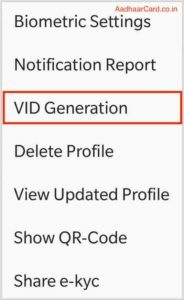 Can I generate a virtual ID? A. No, you cannot generate a virtual ID with enrollment number. The service for VID generation from Enrolment Number has not been provided as of now. Q. I have not linked my mobile with Aadhaar. Can I still generate my VID? A. No, it’s not possible to generate Virtual ID without a mobile number because you cannot use online aadhaar services without mobile number other than Order Aadhaar reprint. This is how easily your Aadhaar Virtual Aadhaar id generate. If you have any problem-related Aadhaar virtual id download, ask your question in the comment box.